John, a client of mine, made tremendous progress over the last few months. Compared to five months ago when we started working together, he is now a different person. You can see it. “I am a thousand times more relaxed these days, and my team has improved performance”, says John confidently. “The other thing was to start exercising regularly and changing my nutrition.” John obviously lost a couple of excess kilos. He looks healthier and much more fit today. “Overall, I feel much more energized these days. Normally at this time of the day [it was 4 p.m.] I would be tired already. Now I enjoy pushing it for a couple of more hours,” he declares with a big smile. In order to improve leadership quality, do we need a more holistic coaching approach which covers nutrition and exercising? Would adjusting my own nutrition and a different exercising routine improve my energy level and performance, too, although I pursue a quite healthy lifestyle already? The latter question lead me to a self-experiment in which indeed I changed my eating and exercising habits. Six weeks into the trial, my answer is a clear “YES” to both questions! Here’s what I did wrong in the past, what I changed, and what results I achieved. See what applies to you; you may find the missing links to improve your own leadership performance – and your quality of life! I thought my lifestyle was quite healthy. I favored a vegetarian diet, and I had fresh fruits and vegetables regularly. Believing that fats make fat I avoided them, particularly the unsaturated ones (e.g. butter). I practiced Yoga asanas (poses) regularly, and I went to the gym for some cardio exercise and workouts with the “machines”. Triggered by John’s positive experience I visited Randall Hatfield from Aspire Fitcorp Asia. Coincidently a “28 Days Body Transformation Challenge” consisting of nutrition talks and group exercises started 2 days later, and that was just ideal for my self-experiment. I signed up. In addition, I invited my friend Thomas Ehle for lunch. Thomas is a fitness enthusiast, a nutrition expert, and the author of “Easy Body Up-Grade”. He challenged me on my carbohydrate intake and suggested to leave bread and muesli aside for a couple of weeks and to see what happens. Ok, I am not going to post before-after pictures here. But trust me, only 6 weeks down the road it’s still hard for me to believe how much my body has changed in a ridiculously short time with much less effort than I had expected! It’s somewhat embarrassing to realize that I thought my life-style was quite healthy, but in fact in many ways it wasn’t. What I believed I knew about healthy food and effective physical exercise were to a great extent either just myths or nowadays outdated knowledge. Regular jogging at moderate speed for a minimum of 30 minutes is great for your health. It prevents heart diseases and is ideal for fat loss. Moderate exercise is better than exhausting yourself. Lifting heavy weights harms your joints. Using expensive machines in expensive gyms is better. Your brain needs “sugar” to function well. If you are German: bread is what you just have for breakfast and dinner, no questions asked. Excuse me but that’s what it is. If any of these myths above sounds familiar to you, too, it’s time to question your eating habits and exercising routine! Of course there is not the ideal nutrition, the one size fits all approach. What turns out great in one study may be considered bad in another. However, it is worth reading some recent studies. Be aware of who sponsored the study and choose what you consider credible sources. Then try a few approaches over a couple of weeks, and finally let your body decide what is right for you. If you don’t exercise, start moving your body. If you exercise, make sure you exercise effectively. Generally exercising may be better than no exercising, but wrong exercise will in best case be a waste of time. Worst case it will cause you harm. It’s worth spending some time on a more holistic approach in order to improve performance at work. Achievement is not just about working hard or smart. 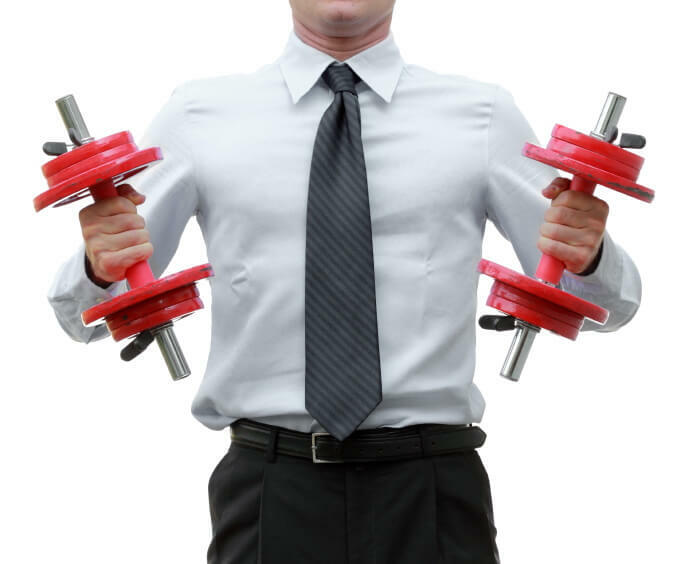 Whilst executive coaching and other personal development activities may help improve your leadership and management skills, you will never achieve your full potential if you do not take care of your physical body. And this requires some basic understanding and experimenting with your diet and workouts. I strongly encourage you to do some self-experiments! (Disclaimer: consult your physician first blabla…) I look forward to hearing about the positive changes you will experience. Meanwhile, I will continue my own experiment. Looking at the results after merely 6 weeks, I am curious what I will achieve over the next 6 months.